Master Bilt VOAM48-60 Black 60" Vertical Air Curtain Merchandiser - 18.2 Cu. Ft. Introducing a new approach to Open Air Mechandisers from Master-Bilt. A total of 16 competitively priced models in horizontal and vertical versions provide industry-leading value and flexibility to fit almost any sale space requirement. Place the grab-and-go convenience of the HOAM and VOAM models in high-traffic areas, such as endcaps for increased profits. Ideal for store entrances or next to food service areas to showcase beverages, pre-packaged sandwiches and salads, produce, and other items for on-the-go customers. All models share common widths of 36'', 48'', 60'', and 72'' so they can be easily interchanged. The contemporary styling of the HOAM and VOAM models provides an attractive product showcase, but these merchandisers are more than just eye-catching. Durable construction means you are also getting a quality piece of equipment. The cabinet interior and back is constructed of painted, 24 gauge steel with non-corrosive stainless steel floor pans on the inside that protect the evaporator coil from spillage. The built-in bumper protects from shopping cart damage, and a textured black finish helps guard against scratches and dents over time. HOAM and VOAM models are also built for reliability and efficiency, in fact, all models already meet 2017 Department of Energy standards. Long-lasting LED lighting in the canopies provides not only product illumination but also helps reduce energy usage. Highly-efficient electronic controller systems ensure the merchandiser maintains a consistent temperature. Additionally, each model features a forced air ducted airflow to ensure cold air is continually circulated throughout the cabinet, keeping stored items fresh. The back of the merchandiser is also perforated to assist in airflow. A low energy automatic condensate removal system is included in all models to avoid interior moisture build-up. Each model features a slide-out condensing unit for easy cleaning and surfacing. For further model performance and assurance, each model features a 3-year parts & labor warranty with an extended 2-year warranty on the compressor. Reversible shelving in HOAM and VOAM models allows for a wide variety of products to be merchandised. Shelves are adjustable in 1'' increments to maximize display space and may be positioned straight or tilted to display items as desired. HOAM and VOAM models also offer larger pack-out space than many comparable models of similar size. With retail settings in mind, HOAM and VOAM models feature refrigeration systems with low-decibel ratings and higher quality background sound for an even quieter experience. All models are also available with remote refrigeration systems. Remote systems also remove heat from the sales floor, which helps lower air conditioning loads. Options include LED lighted shelves, night curtains, lockable security covers for vertical models, sandwich decks for horizontal models, and custom stainless interior or exterior. Heavy-duty casters are also available, as are product hooks, condensate pumps, and higher capacity condensate evaporator pans, depending on the model. For more information on the HOAM and VOAM models, see your local Master-Bilt representative. Visit our website at master-bilt.com, or call us at 800-647-1284. 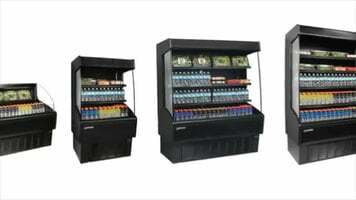 A new approach to open air merchandisers for your convenience store, grocery store, or more, Master-Bilt's line of HOAM and VOAM merchandisers produce industry-leading value and an unmatched flexibility. Watch this short video to learn more. Can I put warm items in my air curtain merchandiser to chill them? This unit is intended for maintaining cold product temperatures, but not for making warm items colder. For best results, items loaded into this unit should be pre-chilled to proper serving temperatures, and ambient conditions should not exceed 75 degrees Fahrenheit / 55 percent relative humidity. Additionally, this unit should not be installed around HVAC vents, doorways, or in direct sunlight. 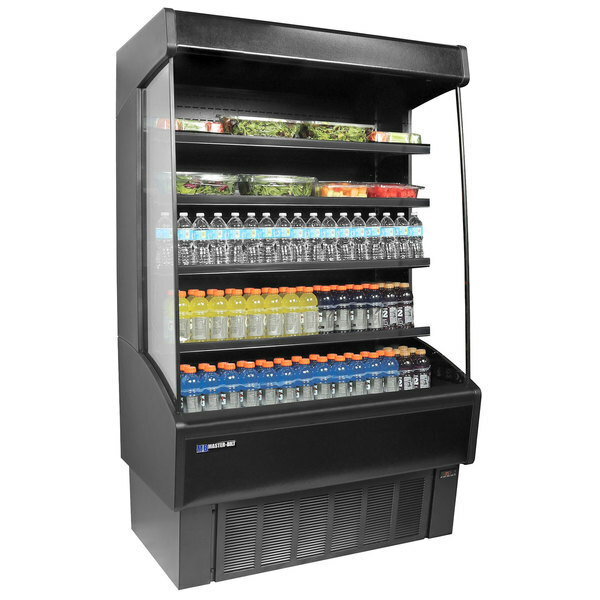 Provide easy access to popular items like soda, juice, pre-packaged sandwiches, and more with the Master Bilt VOAM48-60 black vertical air curtain merchandiser. The unit's vertical orientation and two-tier shelving design with integrated price tag molding allow for maximum storage and efficiency, while the contemporary styling and LED lighted canopy provide an attractive product showcase. A built-in standard electronic controller boasts the ability to monitor defrost functions from the front panel interface, in addition to customizing an audible and visual alarm. A 24 gauge painted and textured galvanized steel interior and exterior add extended durability, and the floor pans are constructed of stainless steel as well, which helps protect the self-contained, bottom mount refrigeration system. The unit uses R-404A refrigerant and has an interior that is insulated with 2" foamed-in-place "zero ODP" urethane, ensuring your food items remain between 34 and 41 degrees Fahrenheit. The shelves are adjustable in 1" increments, and a perforated interior back wall provides better air flow. For added convenience, the condensing unit slides out in front of the case for effortless cleaning and servicing. Other features include a front air intake, rear air discharge, and an energy efficient automatic condensate removal system. The Master Bilt VOAM48-60 vertical air curtain merchandiser requires a 115V electrical connection.